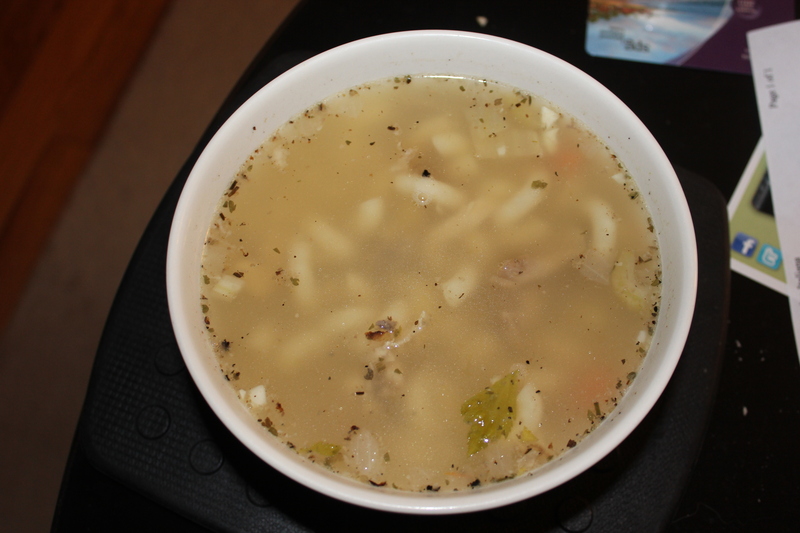 Container of turkey broth. You can use store-bought broth or make your own from leftover turkey pieces. Since the turkey is already seasoned, I usually leave it as is. You can season your turkey if it is plain. Cook the box of elbow macaroni as directed. In a pot, add your broth. This will vary depending on how much soup you want to make. Add the turkey and vegetable mix into the broth. Season the soup as needed with sea salt, pepper, and other herbs. Vietnamese food is one of my favorite things to eat. In Atlanta, I love going to Pho 24 anytime I have a craving. Not only is the food great, this place is inexpensive and open 24hrs a day! 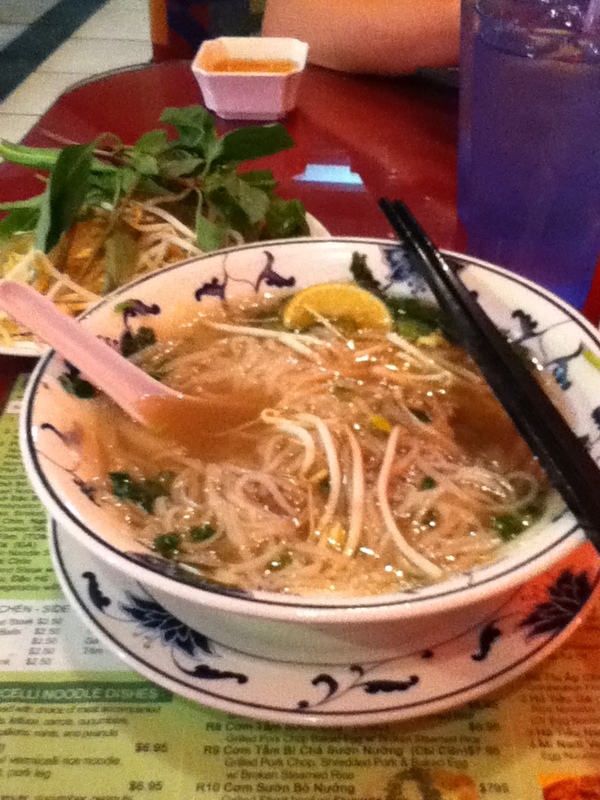 With the weather a little cooler, I thought it was the perfect time to go out for some Pho (soup). Eric really enjoys the grilled meat dishes so we headed over to the restaurant. We ordered spring rolls for appetizer. 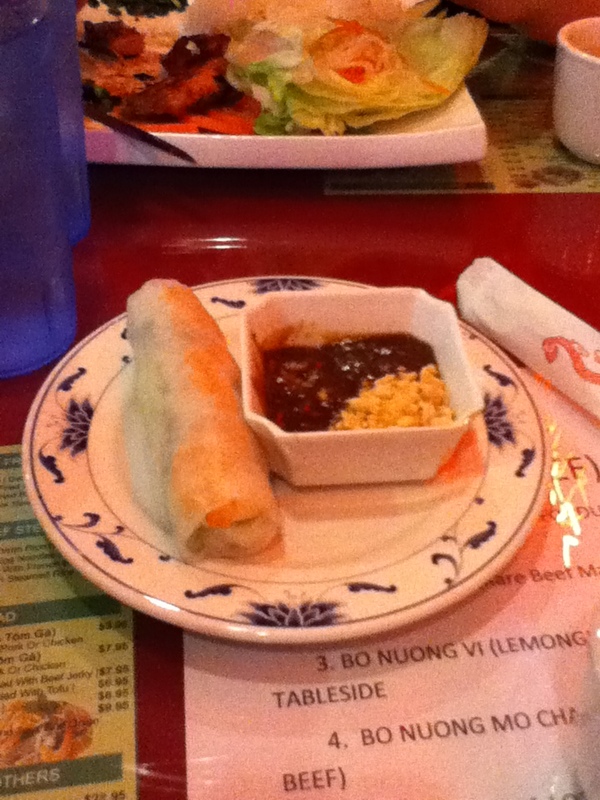 The spring roll is made with fresh veggies, shrimp, and pork, in a rice paper wrap. I like this version since it isn’t fried. I had a “small” pho and Eric had grilled chicken with rice and vegetables. Pho is a soup soup with hot broth, cilantro and noodles. Then they add different meats and vegetables depending how creative you want to get. I just had beef. It also comes with a side plate to add other extras like limes, sprouts, or mint. The meal hit the spot, definitely comfort food in my head. Over the long weekend, we decided to adventure out to try a new Atlanta restaurant. We like to try new places around town and this time we were craving for Thai. A few miles from our house is a place we have passed by several times called Tuk Tuk Thai. It was a nice restaurant decorated as a loft. There was an outdoor eating area with a nice view of the city which seemed nice if it wasn’t 90 degrees outside…maybe next time. I feel like the space used to be a bar/lounge just based on the layout and decor. It was really nice and open, large bar area, with the loft style ceilings and walls. 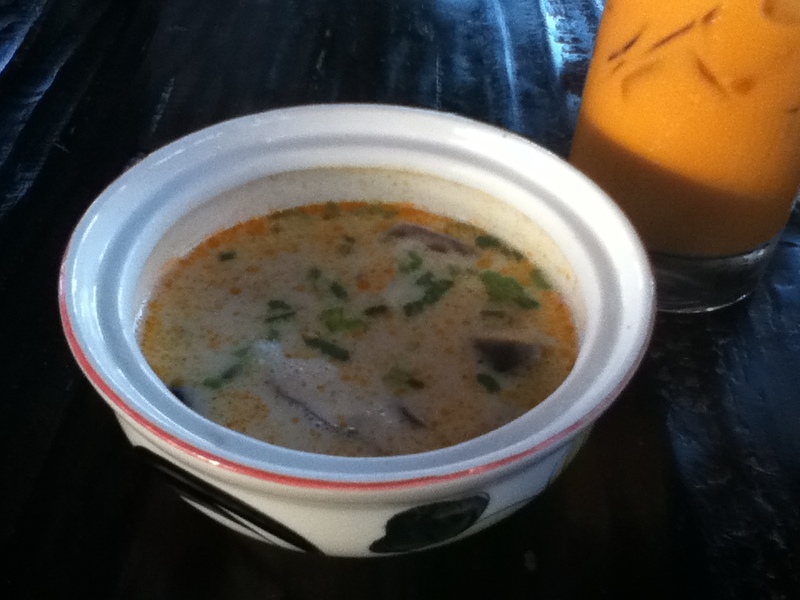 I decided to start off with the tom kha gai soup which is coconut milk based with chicken and mushrooms. Delicious! Next, Eric and I decided to share an entrée. 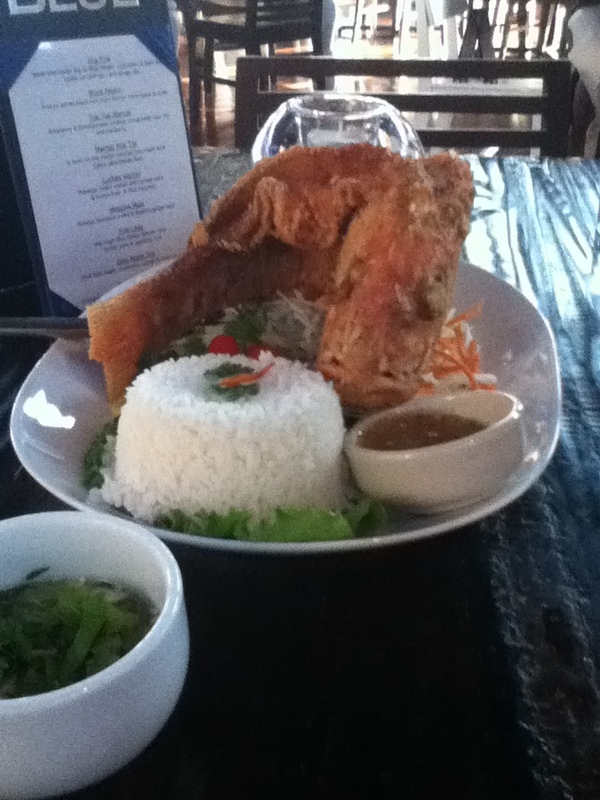 We ordered the whole fried fish with different types of chili sauce and a mango slaw salad. I thought it was a fun presentation of food. I was pretty full from the soup but had a some of fish. As a sidenote, I like to order anything fried with the sauce on the side for 2 reasons. First, if I end up not liking the sauce, at least it is not covering my entire meal. Second, having the sauce on the side prevents it from getting soggy. There is my little insert of food advice. Eric absolutely loves whole fried fish and ate most of it. (During our last trip to Puerto Rico, some of the guys there convinced Eric to order a fish twice the size of this one and finish it by himself. Of course I insisted we could pack the extra but male competition took over and he ate it all to the staff’s amazement.) Luckily, I was able to get my share before he ate it all! LOL. All in all, it was a good food find and I am sure we will go back. We saw others ordering an appetizer of some meat hanging on metal spears. I was definitely intrigued and made a mental note to come back to give that a try.